Yassss! The geniuses at Illumination have hit the nail on the animation head, by offering us one of the cutest films to satisfy our animated movie cravings. The Secret Life of Pets is the straight from the studio who brought us Despicable Me and Minions, so these peeps know exactly what they're doing...and as ever, with every great animated movie, comes the best dolls and toys, and The Secret Life of Pets dolls and toys really no exception. They are flipping glorious! If you have pets of any kind, and wonder what they get up when you're not in the house, then wonder no more! This animated movie is going to let you into their secrets, and we're so happy those secrets are being revealed to us, haha. The Secret Life of Pets features the vocal talents of artists such as Kevin Hart, Louis C.K. and Ellie Kemper to name a few. If you're on the hunt for the cutest and delightfully charming Secret Life of Pets dolls and toys, then hurrrrah, you're in the right place. This place is chocka block full of them. 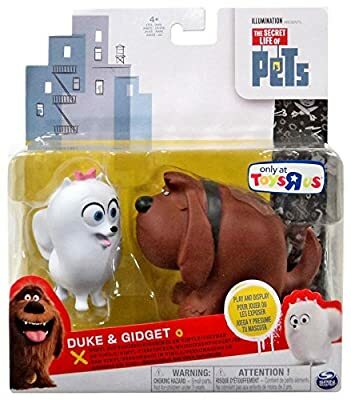 From Snowball and Max dolls, to Chloe and Duke toys, all that you need is right here. If you can't wait any longer and are itching to get hold of those precious The Secret Life of Pets dolls and toys, then you can go straight to Amazon.com's page dedicated to them, right here now! Or, if perhaps you're from the UK, then you'll need this link here for Amazon.co.uk. 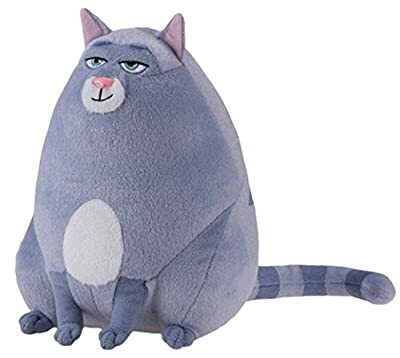 Now, without further ado, let animatedmoviedolls.com present for you, some of the best dolls and toys from Illumination's knock out animated movie, The Secret Life of Pets. Here we go...woof woof and miaow miaow a-go-go! 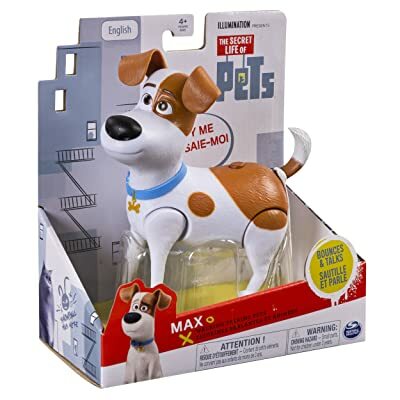 If you've always wanted your own Jack Russell Terrier toy, then this doll of Secret Life of Pets superstar, Max, is bound to set your pulse racing! This adorable plush doll stands at 12 inches and probably the best news of all, is that you don't need any batteries! Say what? Yes, you heard correctly...this plushie doll is perfect for snuggles and bedtime cuddles. Voiced in the movie by Louis C.K, this is your chance to have your own pet (with the secret life, obvs), as Max promises to obey give lots of love and hugs to whoever takes him home. Isn't he just THE cutest, right? 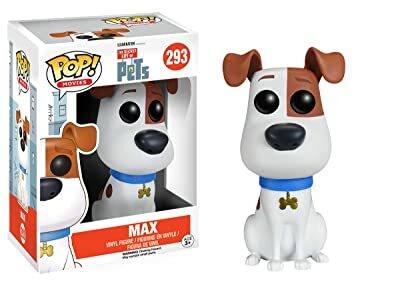 Secret Life of Pets, Max Funko Pop toy! Aaaahhhhh - can.not.get.enough.of.funkos...! Funko Pops are without a doubt, one of the cutest lines available of toys, especially of characters from animated movies. We're delighted to announce that the Max funko pop toy, from Illumination's The Secret Life of Pets is utterly, utterly adorable! Even if you're getting this as a gift for someone, who perhaps doesn't know the movie so well, they will love you for getting them this tip top Max funko doll. The Secret Life of Pets have done very well to score this line of toy awesomeness, right? The Secret Life of Pets, Max toys, Walking and Talking! If you're looking for a less cuddly option, then this Secret Life of Pets Max toy is for you. Not only he is fully poseable, but he also talks, yes, you heard! He talks! He also barks and laughs, and will even utter a line or two from the movie "Alright, let's do this". Batteries should come included (but let's face it, it's always good to stock up, right), so for this Max toy, you'll need 2 AAAs. 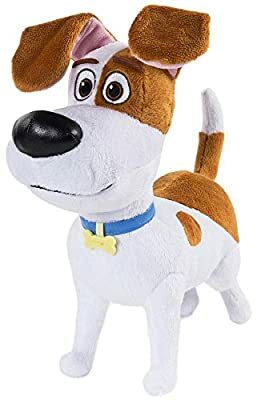 This is such a cute looking toy and looks just like Max from the movie - leaving you or the little ones you're buying this for, to reenact all your favourite filmic, canine moments. Fabulous! Question: Are you a cat person or a dog person? Or can you be both? If you're into cats, then THIS is the plushie doll for you. Here we have the gorgeously presented, Chloe. Isn't she adorable, those eyes say it all, right? Voiced in the movie by Lake Bell, this is a character that is sure to go down in animation history. Such sass and appeal from this, shall we say, larger feline buddy. This Chloe doll is really for anyone of the age of 4 years and up. Isn't she perfect for playtime, or even cuddle time? Dare we say, that Secret Life of Pets Chloe, might be our favourite character, so this is top of our shopping list...but shhh, don't tell Max! Secret Life of Pets, Chloe Funko Toy! Funko are nothing short of being so, so kind to us! Isn't this Chloe funko doll, from Secret Life of Pets just freeeeking awesome. The purple hue is magnificent, and those eyes, oh those eyes! This is one funko with THE most perfect attitude! Soooo cool! Now, I love, I mean LOVE, Funko dolls, they can do no wrong in my eyes...however, one teeny tiny bug bare of mine has always been that the heads are so huge, they often topple over on their tiny feet (just check out the Marie doll from Book of Life), but with this SLOP Chloe funko toy, she has a solid foundation...so no over balancing here! Yassss! Thank you Funko! Oh, and did you know you get this Chloe funko dolls textured, like a flocked covering, to make her a little softer? Well, you can, check out the Chloe flocked Funko doll here too! The Secret Life of Pets Trailer! If you're not sure what all the fuss is about, and you've never seen a whisker (haha) of a clip of The Secret Life of Pets yet, then grab yourself a coffee (or a saucer of milk) and settle down to watch the fabulous trailer. Made by the people who brought us Despicable Me and the Minions, Illumination have another sell out hit on their hands with this beautifully animated movie. Enjoy! 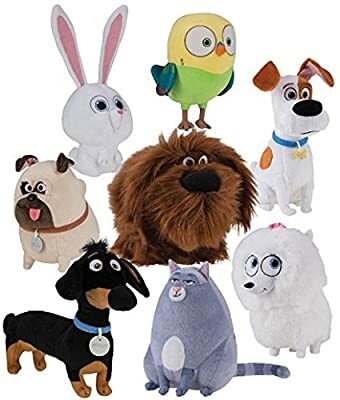 Special Collection: Secret LIfe of Pets Plush Dolls! Yes, you read that correctly - here is your chance to get ALL of your favourite Secret Life of Pets plush dolls in one simple collection. They're all here: Max the terrier, Chloe the cat, Gidget the uber fluffy doggy, Duke the mutt, Snowball the rabbit, Mel the pug, Buddy the dachshund and SweetPea the Budgie! Yes, that's all 8 of the principle characters from this super cool movie. Now playtime or naptime will be the best of times, because there will be not 1, not 2, but EIGHT adorable animals from the cast of the Secret Life of Pets! What's not to love? One day you could have a doggie only party, then the next day, only pets beginning that aren't doggies hehe...sooooo many playful options. So, so, cute and utterly adorable. If you want to check out more about the Secret Life of Pets, find out all you need to know at the movie's website, right here! Out of the entire cast of pets, from illumination's gorgeous the Secret Life of Pets, Gidget here has to be up there as one of the cutest, right? The super sweet pomeranian pooch will woof her way into the hearts of plenty...and here, you can own her for yourself. This Gidget plush toy is beautifully made and just give her a gentle squeeze, and she'll interact with you. Yup, you read that correctly - all you have to do, is tilt her, or give a little squeeze and she'll make noises - and best yet, even quote some hilarious lines from the movie. The perfect gift for any fan of animated movies, or just adorable doggies in general. Is it just me, or are the Funko Pop editions from the Secret Life Pets series utterly adorable? I want them all...on my desk...right now! 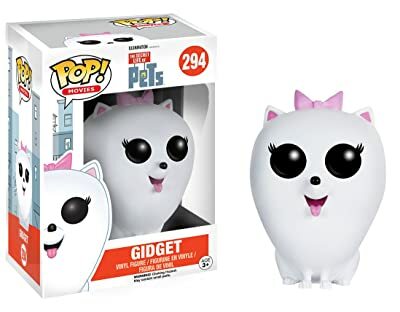 Gidget especially makes for a cool Funko doll. The simple colour contract of white, with huge black eyes and a dash of pink make her very, very stylish and therefore, very, very desirable! What I love best about Funkos is the very virtue of them being a designer toy, anyone can appreciate them. These babies ain't just for kids...no, no! Adults who have never even heard of The Secret Life of Pets will appreciate the classy sophistication this accessory can bring them. A beauty to behold, in a glorious doggie, Gidget style! Perfect! If you're after something a litttle bit smaller, and something that contains more than one character - then hey, you're in for a treat! Here we have a quite petite action figures. We have Duke (10x4 cm) and Gidget (5x5 cm). Aren't they precious? So obviously, two is better company than one, so now you can truly act moments from the Secret Life of Pets, using your own voices and everything. The characters are poseable and a pure delight. Fun! Take our poll...which is your favorite pet? If you've got a soft spot for the bunny, then look no further. 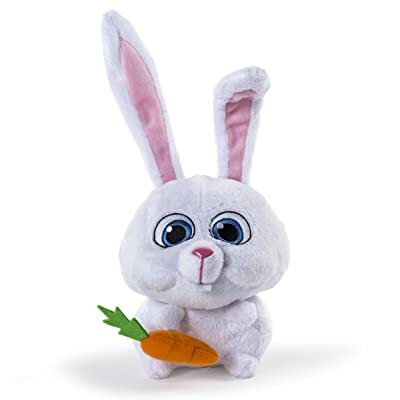 Snowball, the larger than life Rabbit, from the hit movie The Secret Life of Pets, comes here ready to take home in this awesome toy figure. 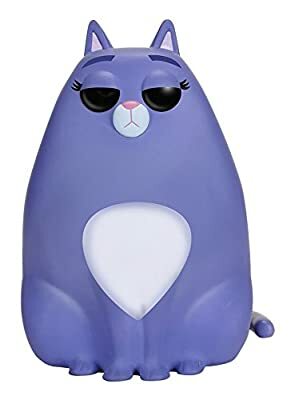 Like every good bunny, this Secret Life of Pets toy will bounce around the room, and even speak to you some of his key phrases from the movie itself. Like having your own real life pet character, to help to relive some of your favourite scenes. What's not to love? Perhaps that it needs batteries, but if you don't mind giving the little tyke 2 of your best AAAs, then that's all he'll need. If you're after a somewhat softer version of the irrepressible bunny, Snowball, then this plush doll version is the one for you. 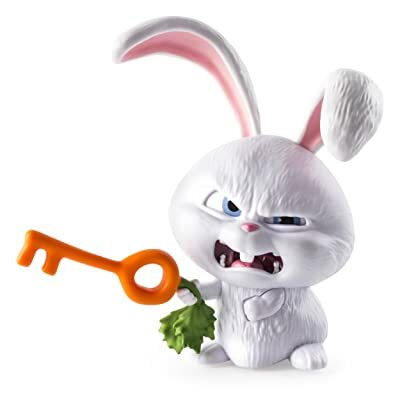 The creators of Secret Life of Pets knew exactly what they were doing as they designed their characters - this one looks all sweetness and light, but he holds a temper...and you'll be delighted to know that if you buy this fab Snowball doll, he'll also be holding a carrot! Accessories are everything! Standing at 6 inches, this cute plushie toy won't take up much space. You can either put him display, take him to bed, or even keep him in your bag all day, as a good luck charm! What do you mean, that's crazy??? We here, at AnimatedMovieDolls.com are obsessed with Funko Pop dolls, we utterly love them! 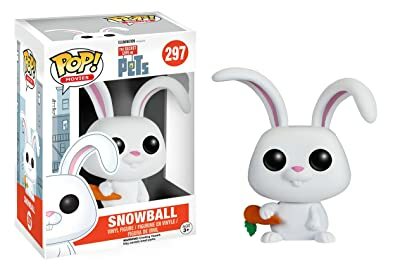 The simple design is a joy to behold, and what's more, they feature the characters of some of the best loved characters, and with Snowball from Secret Life of Pets, they make no exception. Isn't he amazing? Those big beady eyes are enough to make anyone fall in love, right? He'll fit on any shelf, at only three and three quarters inches tall, he'll make the perfect desk companion. 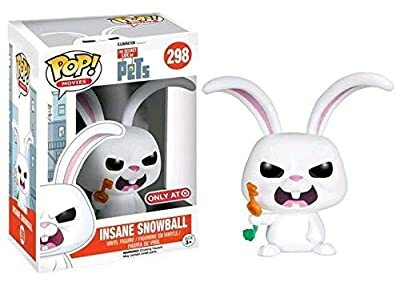 Not one, but TWO, Snowball FUnko Pop! Dolls! That's right! Those wonderful, wonderful people at Funko Pop! HQ have brought us two Funko Pop! dolls for Snowball the rabbit. 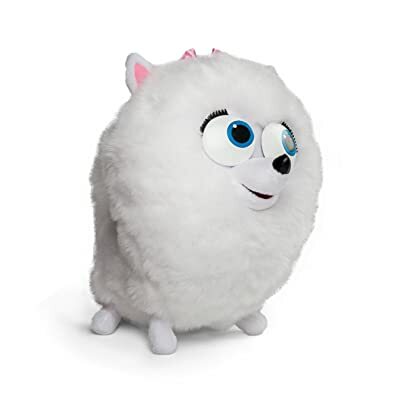 Soooo, if you like your Secret Life of Pets Snowball doll happy or "insane", now you can pick.